What is Periscope and will it work for me? Periscope is a live streaming app that allows you to instantly broadcast your message worldwide. As a business person or someone eager to get your message out to a large audience, you can probably understand why having instant worldwide access would be valuable. So let’s talk… why now? Is it too late to join the live streaming party? No, this is the perfect time to get involved! Twitter has over 1 Billion Users (yes that is Billion with a B). There are approximately 25 million users on Periscope and only about 1% of those people have actually been on air and only about half of those Live Stream with any consistency. Breaking that down further to those that are actually offering consumable content vs watching fluffy sleep or someone who’s ‘scoping an unsuspecting friend who’s had too much to drink, the number of people that are broadcasting in a productive way is less than .25%. That puts you at a HUGE advantage. WHY? Because as more and more users become familiar with Periscope, there will be more people wanting to consume content and a huge need for value to be found. Look at this Twitterverse pyramid. As the rest of the pyramid fills in, your status will rise if you are broadcasting and you will be at the top of the pyramid which is what we call an Influencer. How do people recognize value on Periscope? There are several factors that will be taken into consideration one of which is your “Heart count”. “Hearts” are the social currency of Periscope. When viewers find your content valuable they will tap the screen which produces a visible heart for each tap, that floats up the screen and shows the broadcaster that you are finding value in the message that is being shared. In addition the viewers will SHARE the content out to show they like what is being presented. 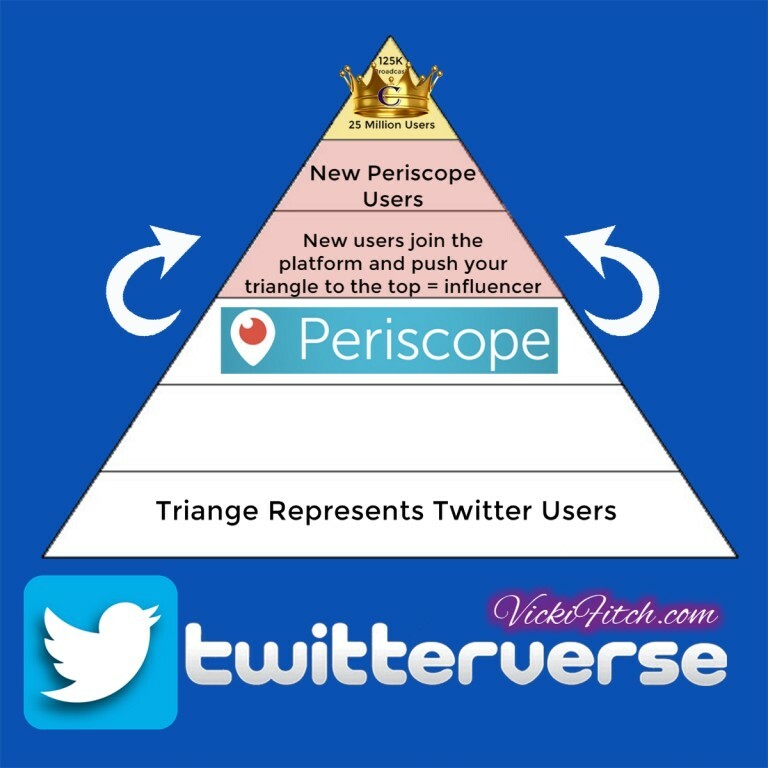 At the time of this article there are 3 ways to share: 1) to your Periscope Viewers (people will follow you to get notification of your content) 2) Twitter – with the live streaming option in the Twitter feed this can produce more followers on both platforms instantly 3) on Facebook – the integration posts a link to allow others to connect to the platform. Encourage your viewers to share to all three platforms if they are finding value in the message. I understand you may be afraid to hit the broadcast button for various reasons so let’s talk about those too. Although in the beginning, we all start with 1 Follower and 1 Heart, that can quickly change. Ifyou want suggestions to get in front of influencers that can help you with the transition, let’s talk. You will likely grow proportionate to your abilities and that works out well. You will get better and more and more people will follow. It takes time to grow a following but it is well worth it and if you haven’t signed up for my Free 12 Week Social Media Growth Challenge, do it now. It comes with a guide to track your progress and weekly tips on different social media platforms to help you get the most out of the time you invest in social media. #HatersGonnaHate, we can’t do anything about it but with the right hashtags like #Entrepreneur #BizChat, #Motivation, etc. few trolls come to the party but if they do, you will have a legion of supporters encouraging you to go on and have a #BlockParty where you block them and they can’t come back. It is really a simple process. Still nervous? Join my Facebook Group, the Entrepreneurial Rock Stars. I periodically have a #PeriHop where all new #PeriPeeps have a safe environment to practice the platform with encouraging people and influencers cheering you on. You are not alone!! You might be asking about other Live Streaming apps like Facebook Live, Meerkat, MeeVee and other players that are popping up on the scene and wondering if they are going to make Periscope irrelevant? My answer is “No Way” but I will save that info for another post.